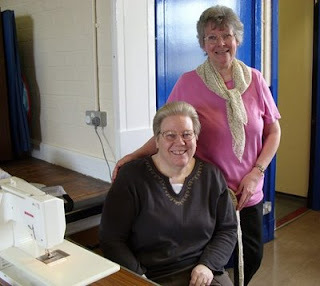 Here is a photo of Janet & me which her daughter took on Saturday when I was at her quilting group. I got to meet Janet as she was my swap partner in a Friends Swap, in it you use the letters so F = Fabric ect for all the letters are used it was great that once we had been paired up we found that we live not that far from each other & that is how i came to go to the group. And she hopes you will be a member on a regular basis. You did so well, considering you were new and using a strange machine. Great job Janice.